To make sure your basement remodeling project is done right the first time, be sure to choose a basement finishing expert that utilizes products that won't attract mold or moisture and won't damage easily over time. For a free estimate in Ronkonkoma, Central Islip, East Northport, Centereach, Commack, Coram, Medford, call us today. All of our high-quality products can ensure a basement environment that is safe, healthy and beautiful. If you're thinking about finishing your basement, our basement finishing services and innovative basement remodeling system can ensure a dry, healthy basement the first time around. 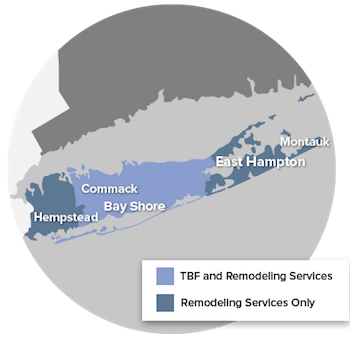 Our services are available in Huntington Station, Babylon, Riverhead, Farmingville, Bay Shore, Brentwood, West Babylon and many surrounding areas. Call us today to schedule an on-site inspection and free estimate!